The painting exhibition came down today. Everyone was very happy and there was a last minute celebration. We also sold one more painting. So I'm pretty happy with that. I'd like to thank Raluka, Cyril, Ximena and JMY for participating. It was great. The next exhibition is of black and white photography. It's called 'Reflections of Ourselves' and hopes to show how much we have changed in the last quarter century. The photos stretch from the 1980's to the present day. Things have changed a lot. In startling but also very subtle ways. Here's the invite. Hope to see you there. 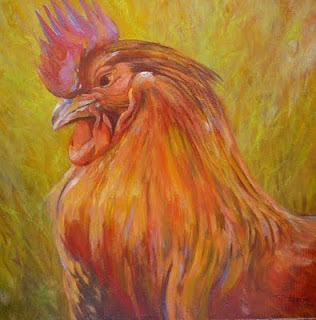 I sold seven paintings this week. That's good. In fact it's looking like I sold another to a Canadian couple this evening but it's not certain. I managed to finish a painting, spoke to my mum on the phone (always a good thing), a friend called in to see me and talk about art. We had a great laugh. She's Polish and can drink whiskey like a guy. I didn't drink any but we had a good talk. Then another recently met friend called into the gallery and invited me to see the antique boutique which he runs on the ile. Lovely place. Seriously good quality antique jewellery, watches and furniture. I love emeralds. Guess it's the Irish in me. The photography exhibition starts next week. There are three really good artists. I'll post more on that later. 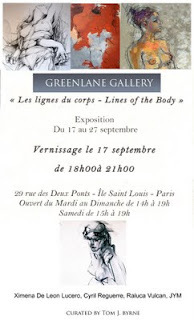 The opening of "Les Lignes du Corps" on the ile Saint Louis. 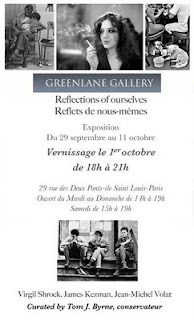 At the moment I'm the curator of exhibitions in the Greenlane Gallery on the ile Saint Louis. 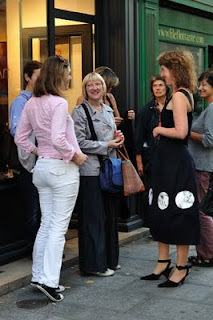 It's 29 rue des deux ponts. Come along to see what's on show. 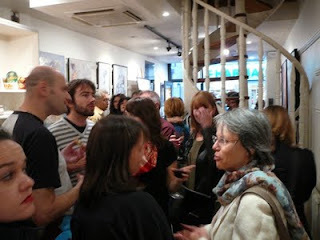 We had the opening on Thursday of "Les Lignes du Corpes" on the 17th at 6pm - 9pm. It went really well and the artists work is terrific. It's based on drawing as the main medium of expression with some colour work by two of the artists to create dynamism and flow. Even with the colour work the lines of drawing are clearly visible. Ximena de Leon Lucero's work has a lot of symbolism. 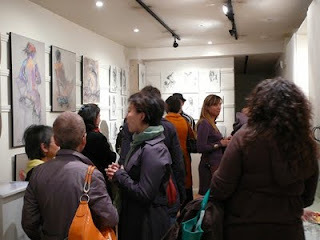 Her drawings, which are big and extremely powerful dominate the show with rich layers of meaning and subtle messages. Cyril Réguerre has painted using line. 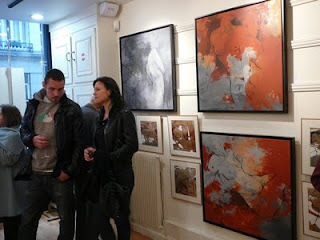 His rich reds and dark figurative symbols coming together to anchor the exhibition. Raluca Vulcan's work is whimsical but her lines are powerful and beautiful to trace. I've been present while she works and it's an awe inspiring experience. JYM's work is almost graphic and reminds me of fashion paintings of the top class fashion houses from the 1920's and 40's. 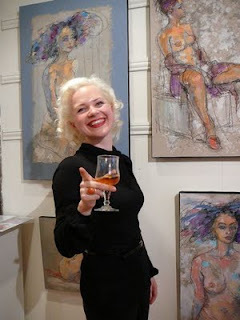 Her work is very powerful and done in charcoal on paper, framed in glass. 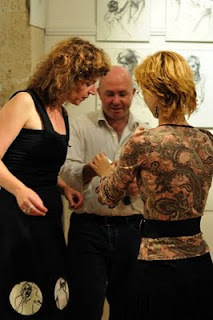 All four artists work comes together really powerfully and each compliments the other. 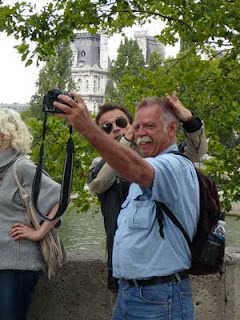 I hope you can visit if you are in Paris. The gallery is open every day except Monday, from 2pm till 7pm. 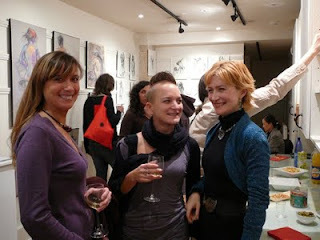 The invitation and photos from the vernissage on the 17th of September. 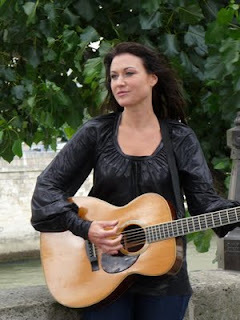 Over the last few months I've been collaborating with a bunch of film makers here in Paris to produce a mucic video for a singer called "Lenna" which could be used to promote her songs. Well it was a bit of a disaster. We had worked really hard in the preparation. The storyboards were great (that was my department) and the camera and lighting crew were top class. Seriously impressive. 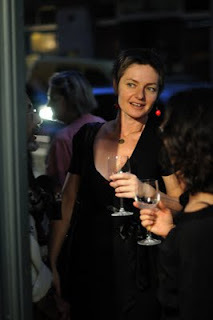 Lenna was incredibly flexible and positive and so were most of the actors. However, the director sucked (no hesitation in saying that) and the production manager didn't have any experience so it all fell apart on the second day. Producing a good film depends on so many skills coming together very well and communicating clearly, respectfully and with dynamism. Despite that, the whole experience was remarkably positive. At the break time we all came together and everyone got on very well. The production crew couldn't face everyone else so we ate in a jovial fashion and discussed possible future projects. If there was a real problem it was that we tried to do too much too fast given the level (across the board) of experience of the people involved. If we had been more evenly matched I think things would have gone perfectly. The creative and technical resources were certainly there. Ah, you don't know what you missed! Sounds like the opening chapter in a book by an old man to an audience gathered around his death bed. We had a great time in Borgogne. Fantastic might be a better description. The chateau is superb. The weather perfect, the company suitably insane and the food superb. We did paint but not enough. Really and truely we tried but there were so many other things to explore. There was a lot more in the way of drawing going on. Thank goodness for Paul who anchored us all into the world of colour and form. As he painted, he spoke and we were drawn around in fascination. That got us going and we attempted to bring ourselves to the creative process. It didn't really work but when I look back I think that this week was more of a battery charging exercise and a bonding experience. We had a wonderful time. It was very creative. We watched movies on a big indoor cinema from 10pm till 3am, every night. Took lots of photos, painted, drew & talked about the past, planned for the future. Drank wine on the balcony and cycled along the canals. It will be even better next year. 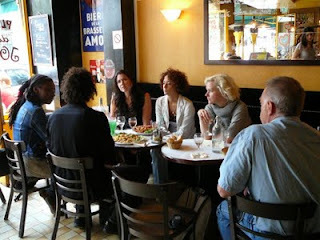 Today is the second day of the artists retreat in Borgogne. It's great!! 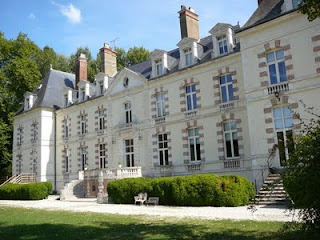 Really chilled out and the chateau is everything we could have hoped for. It started with breakfast out in the sun. 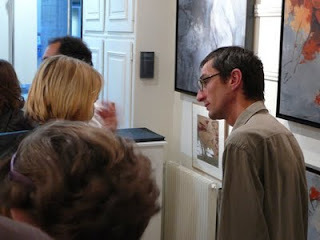 Everyone is getting on well and the days have been interesting with discussion on art, painting and exhibiting. The location is perfect and the people very welcoming. We found an organic market yesterday and stocked up on vegitables etc. Borgogne is a great area. Perfect for artists. Very interesting and lots of history here too.